I was never satisfied with the crop of charging station products for iPhones and iPads that mostly all use the same design with slots to accommodate tablets and smartphones. 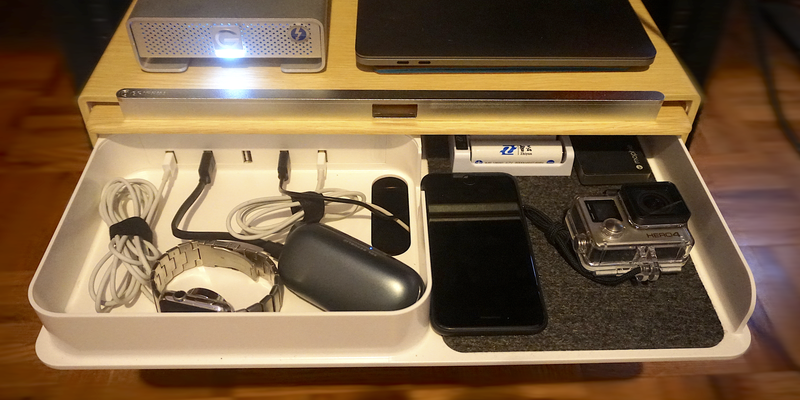 Little to no extra room for my many other devices– my MacBook, camera, external batteries, smartwatches, etc– meant the majority of my devices were still a mess. Griffin’s Cove charging station takes a different approach by offering a self-contained shelving unit with built-in USB ports that can hold just about all of my devices that need charging. Cove is stylish enough to look good just about anywhere in your house; an office, kitchen counter, or in a living room next to not-so-techy decor, and that was one of the company’s main goals. It comes in birch (the color I reviewed), ebony, and walnut color options, and it does a pretty good job of looking like real wood, but it’s not. It’s actually plastic that feels much like the white plastic on the bottom half of the unit that meets the faux wood. The unit, which measures 16.8″ x 12.8″ x 7″, functions well and is otherwise fairly sturdy, although it will probably feel a bit on the cheap and thin side if you were expecting real wood. 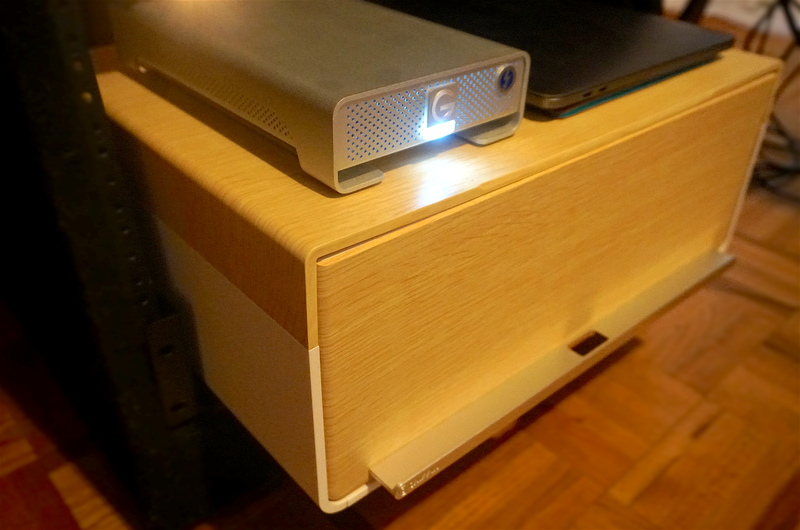 The Cove has three shelves inside to hold your devices. The top shelf slides out to reveal five USB ports with 12W each on the right, allowing you to charge up to 5 iPhones, iPads or a combination simultaneously. A single power cord on the back of the unit powers the USB ports, and it isn’t attached to a separate and bulky brick adapter like some of these products, everything is inside the Cove. The ports are located on the left of the top shelf where there is also a small plastic tray big enough to keep a smartphone or a few smartwatches. A small padded platform to the right is big enough to hold a smartphone or two. 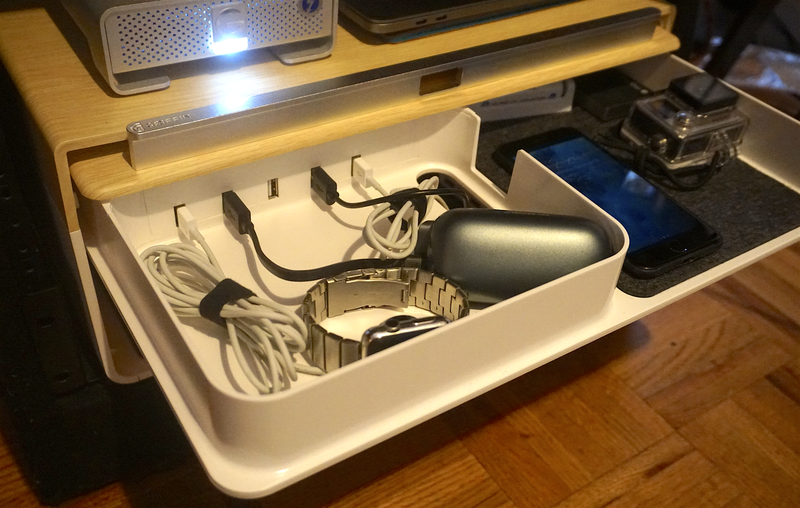 Cord management is up to you here when it comes to neatness, but the small plastic tray in front of the USB ports gives you somewhere to hide excess cord wraps if you have cables that are too long (I’m using velcro cord wraps like these). 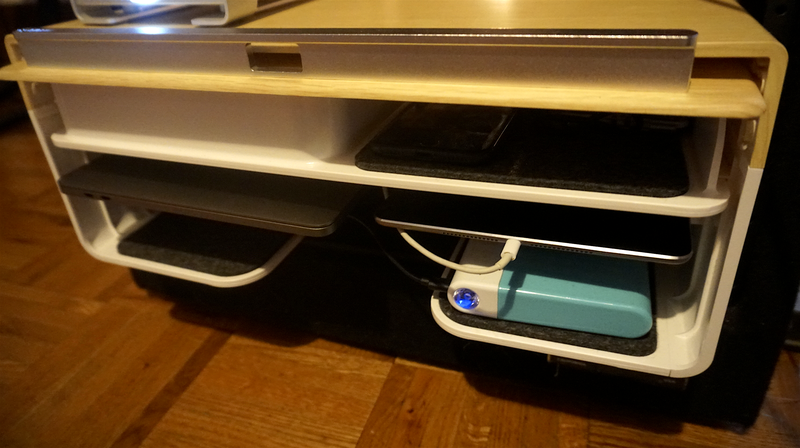 The two lower shelves are big enough to hold an iPad Pro or 12-inch MacBook. For the MacBook you’d of course need to snake in a separate power supply, which the Cove allows thanks to an opening in the back of the unit. The one complaint I have with the design of the shelves is how deep the two lower shelves sit back from the front. It makes seeing what’s in there a bit difficult for smaller devices, but that would likely be less of an issue if the unit was at eye-level (I’m keeping mine underneath my desk lower to the ground). It would have been nice if all shelves were able to slide out like the top shelf— the two bottom shelves are stationary. 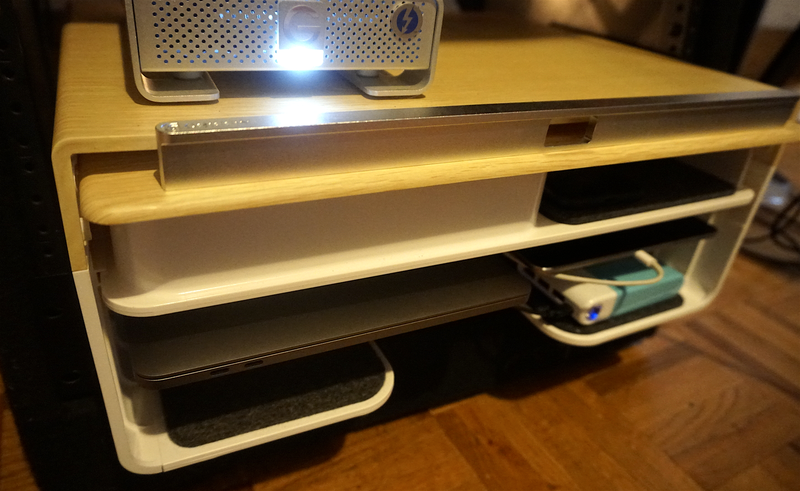 Technically the top of the unit can act as a fourth shelf, and I’ve been keeping a hard drive and my MacBook and camera there. The weight of those devices makes the top sink in slightly (pictured above), so that’s something to keep in mind if going any heavier. The opening in the back of the unit means you can run a cable from the Cove’s USB port up to the top for a camera or other devices. And there is a gap in between the two lower shelves that gives you room for taller devices like a smallish camera or game controller. The door on the front of the unit is made to function as a built-in stand for propping up a phone or tablet. It’s supposed to lock in place at an angle, but I found the mechanism and stand a bit flimsy, and didn’t want to use it and risk breaking the door entirely. Although the door itself worked fine otherwise. The competition | Should you buy it? I’ve been looking for a similar charging station for a while and there are a few alternatives but nothing quite like the Cove. Griffin itself makes a more expensive but industrial-strength version of the Cove called Multidock. It sells for around $600 and charges up to 10 iPads, but it’s a bit pricey and more than most need for at-home use. Then there are smaller charging docks that work sort of like Cove but leave devices exposed— that might be handier if you don’t care about Cove’s aesthetics and are docking devices in and out often. These include docks like the Satechi’s 7 port charging station and Griffin’s PowerDock, minimalist options for just a couple devices like Griffin’s WatchStand, and desktop-organizer style charging stations of varying quality. But I found Cove’s extra room for holding a MacBook, my external batteries, smartwatches and everything else to be a better solution for my setup. It doesn’t limit you to just smaller mobile devices and I know it will fit future devices. Plus it looks a lot neater and keeps dust off devices when the front door is closed. 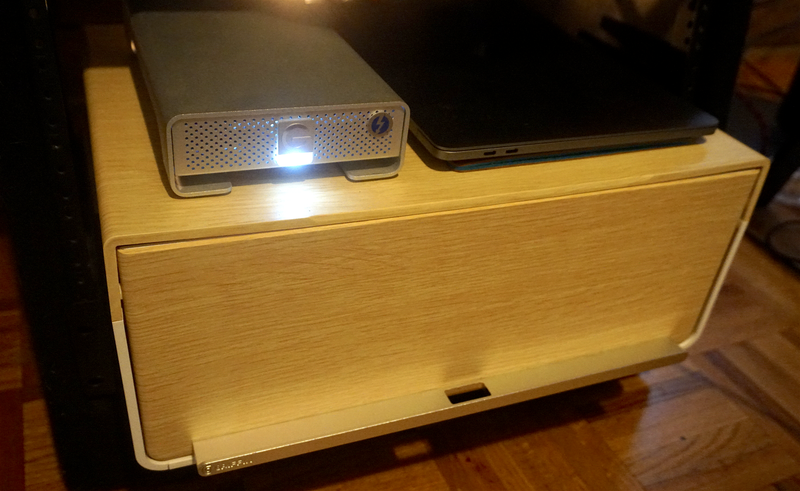 Ideally I’d like Griffin or someone else to make a more heavy-duty version with aluminium construction, like the more expensive Multidock but with Cove’s layout. However, for now this will remain my charging station solution at home. The Cove charging station sells for $199 from Griffin.